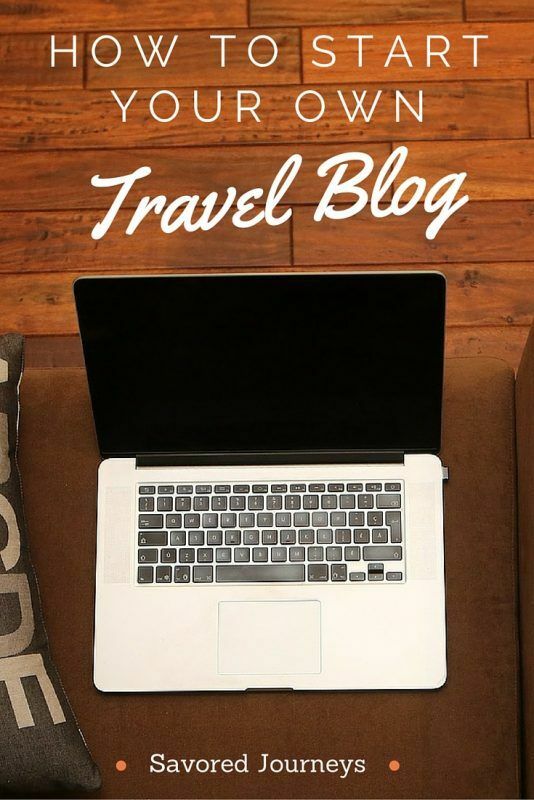 So, you want to know how to start a travel blog? I remember the day I decided I was going to start my own travel blog. I was sitting at dinner with my husband and we were discussing ways that I could get back to doing what I really love to do, which is writing. I started my career as a newspaper writer, but when newspapers started to disappear, I switched to online editing, and 13 years later, I was still doing the same thing. It didn’t involve any writing at all. Since we travel a lot for pleasure, starting a travel blog seemed like the best fit for both my skill and passion to collide. Sharing my love of travel with an ever growing audience of fellow travelers has been one of the most rewarding things I’ve done for myself. If I had a choice to do it all again, I definitely would, despite the many hours of hard work and frustration I’ve poured into it. It is the one thing that I can completely call my own – that lives or breathes by the effort I put in to it. Along the way, I’ve been able to help numerous people with their travel planning and offer loads of travel inspiration through the many awesome trips we’ve taken. If your aim is similar to mine – you want to share your travel knowledge with the world – and you need some help getting started, you’ve come to the right place. Many travel bloggers have pages just like this one that will help you tackle the task of setting up your travel blog, but for those who have asked me personally how to set up a travel blog, and those who have found Savored Journeys inspirational and motivating, I want to offer my own personal take on how to start a travel blog, and show you how I did it, plus help you avoid the mistakes I made along the way. Many people start blogs just to keep their family and friends apprised of their travels, not necessarily as a business or a professional website. If you’re really only starting a blog for personal reasons, I suggest you head over to wordpress.com or blogspot.com and sign up for a free site. It’s really easy and you’ll be publishing your first post in no time. But if there’s even a small chance you might want to take your blog in a more professional direction – whether you’re hoping to eventually make money from it, or not – take the time to set it up properly and think through all of the choices before getting started. This will save you loads of time and effort in the long run and will set you up for blogging success. I’m going to assume that if you’re sticking around at this point, you’ve decided to create a professional travel blog. That’s great. Now, prepare yourself, because this will take some time. Don’t skip this step! The most important first step to creating a successful travel blog is to completely think through the plan for your blog. Without a solid plan, if you just forge ahead without thinking it through, you could end up with a regrettable blog name, an impossible to secure domain name or impractical social media handles. One of the most important decisions you have to make is your blog name. You want it to express your own personality in some way, but you don’t want to be so creative that people don’t get it or think it’s ostentatious. Most of all, you don’t want it to be generic or too much like everyone else’s. I would avoid the most notable words like nomadic, traveling, backpacking, budget, etc. If you’ve seen it before, it’s not a great idea. You can still focus on those topics, but keep it out of your blog name. When I chose my name, I went through dozens before I found one that I liked and that was available. I settled on Savored Journeys before I thought though all the possible issues that might arise from that name. I’m sure you can see this coming… In many parts of the world, savored is spelled savoured. If someone types savouredjourneys into their browser, they’d come up with nothing. Plus, I now have to explain every time that it’s the U.S. spelling. This issue was solved by buying savouredjourneys.com as a domain as well and redirecting it to savoredjourneys.com. But it was a hassle I wish I had avoided. No matter what you end up choosing, it’s only a good idea if the domain is available or can be purchased. If your awesome name is already in use or the domain belongs to someone else, it’s no longer awesome. I suggest you make a list of at least 20 possible names and then start checking the availability. Don’t get attached to something until you know if it’s free. The internet is a saturated place. Be prepared for all of your ideas to be taken. You have to get pretty unique to find something. Once you’ve found a domain name that meets the criteria and that is available, you’ll want to pass it through the social media channels to make sure it’s available there too. Chances are high that it’s available if the domain is free. I’ve seen many blogs with names that can’t be used as handles because they are too long or too complicated. Of course it’s okay to do that if the name you choose is just too good to pass up, but if at all possible, choose a name that can easily convert to a social media handle. For instance, Savored Journeys is @savoredjourneys on every social media channel. This makes it very easy for people to find me, retweet me, like me, engage with my profile. Your username on Twitter can only be 15 characters long, and I think that’s even too long. Remember that you will often want to include your handle in the 140 character space you’re given. Unlike with a wordpress.com blog, if you want to be serious about blogging, you will need to purchase your own domain and find a host. The easiest way to go about this is to pick a hosting platform, like A2 Hosting or bluehost, and register the domain through them. If you do that, they will configure the domain for you. To do it this way, skip this step and go to #3. Another easy method for purchasing a domain is to just buy it directly from namecheap when you find a domain you like in your search. I personally have always bought my domains through namecheap. I suggest you buy all domains you wish to redirect to your main site. For instance, I bought savoredjourneys.com, .net, .org and also savouredjourneys.com. It’s an extra cost, but by doing this, you ensure that someone else won’t scoop up the .net version of your site name and undermine your efforts. I recommend that you host your site at A2 Hosting. It’s got everything the other hosting services provide, but with a lot more uumph. If you don’t know what I mean by that right now, you will once you start getting some significant traffic to your site and need it to start working faster and harder for you. They offer many different options to suit your needs in the shared hosting category, which is what you’ll want to pick for your new site. No need to worry about private hosting until you’ve started to generate some traffic. You can then upgrade your plan when your audience grows or your needs change. I’ve not always been on A2 Hosting. I moved to this service after having a little too much downtime on another hosting platform. I found quickly that the service is better at A2, and the Turbo plan gives 20x faster page load speeds over the competition. Those two factors are enough to convince me. If you don’t like the looks of A2 Hosting and want to try out something else, we also recommend Bluehost. It seems like a daunting decision, but it’s not because you can change your plan whenever you want. I suggest going with the Swift plan because it gives you all you’ll need when starting out. You can upgrade to Turbo later. The next step is to choose and register your domain, if you haven’t already. I prefer to buy domains right through the hosting website, because it’s easy! Type your preferred domain into the box. If it’s available, you can add it to your purchase. If you’ve already purchased a domain, you’ll need to transfer it to A2. This is if you haven’t yet begun using the domain on a website. If you have already used this domain on a website, you will need to check the box that you will be using an existing domain. In this case, you will need to update your nameservers to point to the new servers. This is what I did when I moved from my old hosting provider to A2. 3. Create your account and complete the package and billing information. The next step is to fill in all of your account information and configure your site. You will choose your billing cycle (you can choose to pay monthly, yearly or for 2 years – chooseing a longer period saves you money). Most of the other options can be left as is. You may choose to add a security certificate to your site to make it https. And finally you can choose to have your blogging application auto installed. The preferred application is WordPress, so you can choose WordPress from the dropdown and it will automatically configure WordPress for you and send you the credentials to login with. That will enable you to skip the next step, Step 4. The next step in creating your blog is to download WordPress. I’m using bluehost screenshots as an example for this step, because if you chose A2 Hosting, you can have it install WordPress for you through the CPanel (just click WordPress under Apps and install), and you would skip this step. If you chose bluehost or another service for your hosting, you’ll have to follow the steps to download WordPress. Are you confused about WordPress versus WordPress.com? These are two separate things. WordPress.com is a commerial site where you can host your blog for free, with limitations – the two most important being that your domain will be yoursite.wordpress.com and that you cannot upload or alter your own site template, which will restrict your creativity. It runs on the open source WordPress platform and is accessed at WordPress.com. WordPress.org allows you to download a copy of the WordPress content management system for free. It allows you to have complete control of your site, so you can tailor it to your hearts content. The catch is that you have to have your own hosting server (thus the need for bluehost), and it is quite a bit more work to set it up. But you’ve wisely chosen to go this direction, so now you need to go to WordPress.org and download the CMS. 2. On the dashboard, you’ll see a section called Website, under which you’ll see a button called “Install WordPress”. Click that. 3. You will then see a green button that says “Start a brand new install”. Click that. 4. You will be asked to select which domain you would like to install for. Select your registered domain name and click the Check Domain button. Click the box next to “Automatically create a new database for this installation. Click the box after you’ve read the terms and conditions. 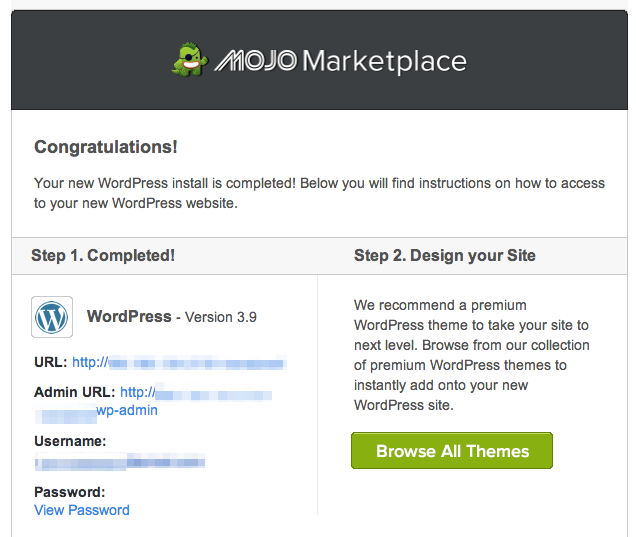 You now have a WordPress site where you can login and get started building your site. Now that you’ve got a fresh install of WordPress, you can log in to your site and begin building your perfect travel blog. To log in, go to your new domain and add /wp-admin/ to the end of the URL, like this: www.mydomain.com/wp-admin/. You will be presented with a login screen, which is where you will paste in the admin username and password that you created when installing WordPress in the last step. Now on to the fun part – designing your travel blog! Designing your travel blog is the fun part, but it’s not incredibly easy if you don’t know anything about website design, coding or graphics. In order to really do your blog justice and make it look professional, you’ll either need to become a jack of all trades, or hire someone to do it for you. If you don’t want to spend a lot of money, you should plan to start wearing a lot of different hats from now on. First thing is to pick a theme. You can search through dozens of free templates on the wordpress.org theme directory, or a popular theme sites like Envato Market themeforest. I’ve bought a few themes (including my current theme: Flatsome) from the Envato Market and I have been very happy with them. There are dozens of themes to choose from in various categories. Use the search bar to look for “travel blogs”. You might be hesitant to buy a premium theme when you’re just starting out, since you’re not yet making any money from your blog, but it is a good investment and will keep you from having to redesign your blog. Purchased themes are updated frequently with new features, offer support, and are more robust and powerful. Once you’ve chosen a theme, you’ll need to install it on WordPress. Generally, the theme will come with instructions for installation, and it’s relatively straight forward. It’s when you want to start getting creative and changing parts of the theme that you’ll need to invest more time and knowledge into it. Creating a child theme is a good idea if you’re going to make changes, so those changes don’t get overwritten in an upgrade. Hopefully you were considering possible logo designs when you though up your name, so you already have some ideas. If not, spend some time envisioning what you’d like your logo to look like. Check out other travel blogs to see what the current design trend is. Currently, small logos in the upper left corner of the site is trending, rather than large full width logos. If you’re not graphically inclined, you’ll probably need to hire someone to design your logo. It’s better to put a little money into your logo than to do it yourself and end up with something poorly designed. The logo is face of your blog. If it’s not professional, you will lose respect and trust for your readers. We went through many different versions of our logo before we got to one we liked. Consider hiring a designer from popular sites like fiverr.com or 99designs.com. Check out both and decide which is right for you. While a tag line isn’t as critical as the other elements of your blog, it is still important. You want to write a tag line that is succinct and clearly explains the message of your site. Our tagline is “Affordable travel, food and wine”. It’s not fancy, but it gets the message across. Are you wondering why you need plugins? Or even what a plugin is? Don’t worry, it’s not as confusing as it sounds. WordPress offers a great set of tools for you to run your site efficiently, but sometimes they don’t offer a specific functionality. That’s when plugins come in handy. They are additional pieces of functionality that you can add to your site. WordPress already comes with a few plugins that you’ll want to keep and activate. The most useful are Jetpack and Akismet. Jetpack does all sorts of great things, like speeding up performance, providing security and enhancing productivity. You can decide which of its features to activate. I currently have these activated: Photon, Protect, Single Signon, Sharing, Publicize, Promote. I’m also using the Carousel, Enhanced Distribution and Gravatar Hovercards. They are all easy to set up. Akismet is very important as it helps limit the amount of spam you receive as comments on your posts. Yoast SEO – Helps you configure your post with SEO best practices so you’ll do better in search engine rankings. WP Super Cache – Provides caching for your site so it loads faster. EWWW Image Optimizer – Compresses the file size of images to reduce the page size and loading time. Easy Social Share Buttons for WordPress – This is a premium plugin that I think is well worth the cost. It allows you to set up nice looking and easy to use social share buttons on your posts. You can buy this plugin for $19 from the Envato Marketplace. SumoMe – If you want to go the free route with the social share buttons, I think the best option is SumoMe. There are a few other useful features that you get with this plug in too, but you’ll have to live with their branding being visible on your site (or pay for the premium version). Google Analytics – You don’t need Google Analytics to post to your blog, or even to have a successful blog, but if you want to see how you’re doing and understand a little bit (or a lot) about your audience, you need to install it. At first, looking at your stats on Google Analytics can be a little disappointing and discouraging, so I recommend installing it and then maybe just checking it once a month or so for the first 3-6 months. Don’t get depressed by low numbers. We’ve all been through it. You can’t expect your audience to be massive right away. You have to work hard at it and slowly you will see the numbers increase. To install Google Analytics on your blog, download the Google Analytics Plugin and activate it, then follow the instructions under Settings. Set up a Contact Us page with a contact form (available in the Jetpack), so you can start receiving email from readers. Eventually, you’ll want to think about what type of free content you might be able to give away to entice subscribers. Set up a popup or hello bar to start gathering subscribers. Set up an About Us page. The final step to starting a successful travel blog is to set up your social media profiles and get connected in Facebook travel blogger groups. These two things will help you reach a larger audience and promote your content more than any other things you can do. Of course, you have to have content to promote first, so if you haven’t written any blog posts yet, you should take the time to do that before getting bogged down with the effort of setting up profiles. I would suggest trying to start your blog out with at least 5-10 solid pieces of content. How-to and list posts are very popular and will start getting you traffic right away. If you start promoting your blog with only one or two articles, it won’t look great to initial readers and they won’t be inclined to return. Once you’re all set up with a few posts and ready to get going with promoting your blog, I suggest thoroughly reading, studying and implementing the recommendations and tips in this post for new bloggers on social media and SEO tips to boost your blog. It’s got a ton of information! Once you’ve got some content to promote, choose which social media outlets you plan to use and create a profile on each. I recommend the these five networks: Facebook, Twitter, Instagram, Pinterest and Flipboard. There are dozens of others, of course, but these five will give you the best start. You can focus on others later. Try to create each profile with the same name. I use @SavoredJourneys for every one. It’s just easier for everyone that way. Each social media platform has pros and cons, and each brings in traffic, so they’re all worthwhile. However, none have performed as well as Pinterest for me. Pinterest regularly brings in 90% of my social media traffic. Social media traffic makes up 48% of my overall traffic. So you can see how important Pinterest is to my site. Set up a profile and start filling it out with awesome travel pins in at least a dozen top travel boards. Join group boards. I have one called Exciting Destinations that I would be happy to add you to (just follow me and then send me a note that you’re interested). The backbone of your travel blog is the content that you write. Without great content that people really want to read, you have nothing more than a shiny new website. In order to start attracting readers, you need to build up a solid list of articles. You’ve already decided on your niche, and now you need to stick to it as much as possible. Give people exactly what they expect to read when they come to your site. My site is called Savored Journeys. People expect to find food articles and photos on my site. The best tip I can give a beginning blogger about content is to use good SEO, even from the very first article you publish. I know it’s a lot to learn all at once, but nothing will give you a stronger base to build on than using good SEO. We have a few articles that can help you get started with SEO. The first one talks about finding good rankable keywords, which is what you should do for every post before you beginning writing even a single word. Once it’s written, make sure you add these on-page SEO signals to help Google rank your page. ⇒ Want to know more about SEO? Check out our website for bloggers, Make Traffic Happen, for lots more great tips and tricks to boost your rankings in the search engines. We also have two ebooks for bloggers to help you understand SEO and implement it on your blog. You can start off with a basic marketing plan, which includes posting to each of the five social media networks whenever you publish a post. You can do this manually, by going to each network and customizing a post. Or you can use the Publicize feature of Jetpack to have WordPress post to the networks for you. (Note: this doesn’t work for Pinterest or Stumble Upon). I think it’s best to do it all manually, at least until you get the hang of it. Go to bitly.com and transform my long URL into a shortened one, then post on Twitter using my bitly URL. Use the social share buttons on my post to pin to my Pinterest board and group boards. Use the “Add a Link” button on Stumble Upon to add my post. Other ways to promote your content is to add it on Google+, Flipboard, and mention it in an Instagram post. Make a short informational video about the post and put it up on YouTube. Email key influencers in the niche and let them know about your post. Share it with other travel bloggers. There are a million ways to get your content seen. It took me almost a year of blogging to figure out that I could connect with other travel bloggers via Facebook Groups. What a difference that made! As soon as I got connect into a few awesome Facebook Groups, my blog started to take off. There are tons of groups, and many different ways in which each interacts. You’ll want to join a few and choose which ones work the best for you. I love the comraderie, the ability to ask questions and learn from more seasoned bloggers, and working together for a common goal. The Facebook Groups that I recommend and personally participate in are Make Traffic Happen (which is run by me and a fellow blogger), We Travel We Blog, Pinterest for Travel Bloggers, and Travel Bloggers Mega Share. You can also get a great start with building backlinks to your site by adding your URL to travel blog directories, like this one extensive one on The Longest Way Home. If you’ve made it this far, I can only assume you’re pretty serious about starting your own blog. You may still be in the planning stage, or you may have just gone through all the steps mentioned above and created a blog of your own. I know this is a lot of information. It will seem overwhelming at first, but if you follow these steps, you will be well on your way to building a successful blog. Of course, you can’t stop here — there are a lot of other aspects to managing a travel blog, such as building an audience, maintaining consistency, improving productivity and producing quality content. Each of those topics deserves a post of their own. I would encourage you to finish the steps provided here and get some good content up on your site before you get into the weeds. once you feel like you’ve completed these steps and feel confident about it, then you should move on to more in depth topics. Most important of all is that you have fun, enjoy what you’re doing and don’t take it too seriously. It takes a lot of willpower, motivation and determination to run a successful travel blog. You won’t be getting paid for any of this work until you’re much more established, and if you don’t love it, your blog will end up in the pile of forgotten travel blogs. Now you’ve learned everything you need to know about how to start a travel blog. Good luck! If you need any help or have questions, feel free to get in touch with me. (Disclaimer: This post contains affiliate links. One of the way bloggers make money is through affiliations with companies they trust and recommend to others. I use all of the products and services mentioned in this post and you are under no obligation to use any of these links, but if you do make a purchase through these links, I will receive a small commission. Thank you for your support).